(Top) The ice projection is complemented by images displayed on four scrims which deploy and retract several times during each game. (Bottom) Four 30,000 lumen LIGHTNING 45 sx+ displays driven by video source material from Green Hippo Hippotizer servers create an image mapped to a 200-foot by 80-foot image on the ice. 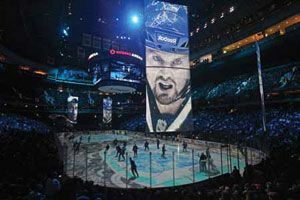 Ice hockey’s Vancouver Canucks installed a new Digital Projection International (DPI) high-brightness system at the team’s Rogers Arena in time for the start of the new season. Designed to reinforce the team’s brand identity, intensify fan loyalty, and, just as importantly, encourage early attendance and help increase revenues, the DPI system is integral to a pre-, post-, and in-game entertainment package that resets the bar at a new high for creativity in the NHL. Mark Raham, creative director for the Canucks, called on turnkey systems integrator Epic Production Technologies for the large-scale imagery solution. From Epic’s Vancouver office, VP of sales Larry Darling, senior project manager Eric Sambell, and project manager Greg Pauker spearheaded the project, which was implemented during the off-season. Darling noted that time was tight: “The Canucks went to game seven of the Stanley Cup finals last year, which significantly compressed the downtime between playoffs and pre-season.” Combined with a busy schedule of other events, including music concerts, as well as ice maintenance at the 475,000-square-foot arena, that meant that Epic could often work for only four or six hours at a stretch, he reported. Four 30,000 lumen LIGHT NING 45 sx+ displays were selected for the project, driven by video source material from Green Hippo Hippotizer servers, split into segments by a Datapath X4 videowall processor, to create an image mapped to a 200-foot by 80-foot image on the ice. Creative content is built to 1920x1080 native, expanded to 2800x1450 by the Hippotizer, then cut into separate channels of 1400x1050 by the Datapath machine. The Hippotizer also provides control of the image overlaps and edge blending. The system is brought into play before the game to build excitement in the crowd, and display imagery during the national anthems and pre-game ceremonies. The system projects rock concert-style visuals during the light show at the end of each intermission, and is also deployed during the game, during periods when there is no action. At the end of each night it is again brought into play for the presentation of the Three Stars, the game’s MVPs. An installed L-Acoustics V-DOSC speaker system supplies the accompanying audio. The projectors needed to be installed as close as possible to each center half of the ice in order to align the images with the ice rink. Locations 90 feet above the ice provided sufficient room to shoot below the clock without creating an obstruction. The integrated pitch, roll, and yaw adjustments facilitated by DPI’s RapidRig rigging frames allowed the installers to avoid lighting trusses, banners and other obstacles and still accurately frame the images. Precise mapping of the images to the ice was further aided by the expanded lens shift capabilities built into DPI’s LIGHT NING platform.